The name Coram in large red bubble writing on the charity headquarters nestled next to The Foundling Museum. A statue bearing the full name of Thomas Coram seated nearby – bronzed, frock-coated and permanent. He has a friendly face and a reassuring sturdiness: shipwright, tradesman, champion of unpopular causes. I’m early and spend a good 20 minutes in the café, just me and a host of familiar names – names I’ve grown up with, characters I’ve loved: James Bond, Jane Eyre, Anne Shirley, Frodo Baggins. Lemn Sissay’s wonderful poem Superman was a Foundling covers the walls. We’re given a private tour of the museum by Caro Howell. This feels like an immense privilege. You can tell how passionate Caro is about the story of the place, its collection and meaning. The good things that Thomas Coram and his fellow philanthropists, including William Hogarth and George Frideric Handel, did. And they did do good things – good things in bad times. But, there are several unsettling things that strike me during our tour. The story of the studded banister, designed to stop small boys from sliding down. The mallet, used by the matron to maintain silence during meals. The humble serge uniforms and the predestination of domestic or maritime service – a useful life. The thing that strikes me most is another wall of names. The names created and given to foundlings in place of their original identity. There are several panels of these names in one of the exhibition rooms. Names that are a strange combination of the plain, the earnest, the historical and the biblical: Isaac Bliss, John Sparrow, Henry Agincourt, Ezekiel Jones, Stern Noy, Mary Grimes, Mary Tulip, Mary Reason, Inigo Scotland, Oliver Cromwell, William Conquest and so on, and so on. There’s even a Perkin Warbeck, poor child, pretender. I learn that when a baby was admitted to The Foundling Hospital, he or she was given a unique admission number that was worn around their neck at all times. This small person would then be dressed in new clothes, given a new name and baptised in the Chapel on the following Sunday. Once a baby was re-named, their admission number was the only link to their origins and would be quoted in all records and correspondence: Baby 38; Baby 4,104; Baby 18,607. Their original name was lost; to become a foundling was also in some sense to become a lostling. More names, famous names. Names that have stood the test of time and good taste. 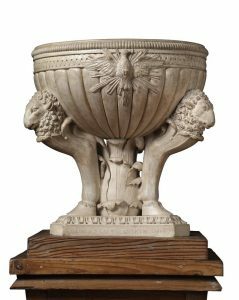 Paintings, sculpture, music, fine furniture and plasterwork by masters of their craft – donated to The Foundling Hospital in philanthropy and inscribed in Latin, ‘made by and given by’. More names. Our names pulled from a tricorn hat and matched with objects from the collection. My name is pulled last and I am matched with the baptismal font. I’m pleased – I know that somehow my sestude will be about power and powerlessness, the weight of a name and the re-forming of identity. I go and take a closer look at my object, which sits under the panels of foundling names. I think it’s rather clumsy and ugly, in the way that ecclesiastical objects often are. The font is supported by three burly lambs, a motif that echoes The Foundling Hospital coat of arms, a logo. It also carries names: Coade & Sealy, Lambeth 1804. Lambs from Lambeth, the Lamb of God. The font was made for the Foundling Hospital Chapel by Coade & Sealy in their Lambeth factory. Made by and given by; my cynical self thinks – what a good marketing strategy. It’s made of Coade stone, an artificial stone created and manufactured by Eleanor Coade, an incredibly successful businesswoman. Coade stone is a mixture of grog, crushed flint, fine quartz, crushed soda lime glass and ball clay. The material is cast in moulds and fired in a kiln. Eleanor Coade called her products Lithodipyra, a name constructed from Ancient Greek words to mean ‘twice-fired stone’. Her objects grace St George’s Chapel, Windsor; The Royal Pavilion, Brighton; the Royal Naval College, Greenwich; a large quantity was used in the refurbishment of Buckingham Palace in the 1820s. I feel that there is a connection between the stone’s artificiality, it’s twice-firing and the artificiality of the foundling names, their twice-christening. As people peel away from The Foundling Museum, I’ve got a couple of hours before my train home and find a pub, get some dinner and a glass of wine. The pub is called The Marquis Cornwallis, named for a merchantman and convict ship that was dispatched from Ireland to Australia in 1796 and then employed by the East India Company between 1798 and 1800. Another 18th century seafaring connection. Another link with the powerful and the powerless. And my sestude comes to me, almost fully formed, there in the pub. Between greasy-fingered bites of Southern Fried Chicken, I make notes and murmur words to myself. And names: Nancy Monday, Mercy Draper, Philadelphia Smith, Judith Tinker. Here, my life is wrighted by a shipman’s steady hand. Embossed by a Lambeth eagle. A lostling name, given in love, is ghosted. Judith Tinker take my part. My self is coaded, like this stone. We counterfeit. My name: you made it and you gave it.